If you have one of the very latest Harley Davidson's with the electronic throttle (wire throttle instead of cable throttle) as shown at the bottom of the following webpage: http://www.sideroadcycles.com/ImportedMotorcycles/ImportHandlebars/ImportHandlebars.html then be aware that installation may be difficult due to the complexity of the throttle mechanism. We have had reports of some customers being successful but we do not encourage it by any means. The technique is to place the epoxy on the throttle tube ONLY inboard of the end gear mechanism, and when you slide the heated grip into position, DO NOT pull the grip outward or you will contaminate the throttle gear mechanism with epoxy. If you purchase our heated grips for this application, attempt to install them and are unsuccessful, we cannot take back the grips with epoxy inside them or with obvious handling marks, as we cannot repackage and re-sell them. See the photos at that webpage link to understand why. 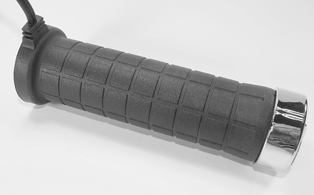 This grip also fits many Japanese Cruisers with 1" handlebar diameter and 1-1/8" throttle tube. Our unique internal Heat Isolation Ribs naturally limit heat transfer to the handlebars and put heat where it is needed - the rider's hands. Patented Heating Elements are "burn-out" proof, we use .025" dia. wire. Comfort-Sized grips naturally reduce wrist and hand stress. CUSTOM OPTIONS. All our grips come stock with a three position toggle switch allowing you to select high or low or no heat. Available Options include a handlebar mounted switch, mini switch or infinitely variable heat controller. When the variable heat controller is ordered you will not use the standard toggle switch and resistor, but they're left in the kit if for some reason you elect to use them instead of the electronic controller. Inside Diameter: Left ID = 1.000" and right = 1.130"
Available Options: Handlebar mounted switch housing, mini switch, variable heat controller, epoxy.